The Mk III is now in the same noise regime as the Sony PCM-D50, Sony D100, or Olympus LS-100. This incredible progress forces me to examine Tascam in a new light. However, while EIN is of great importance for those of us who record quiet sounds, it is certainly not the only factor. The amount of distortion, frequency range, presence of resonances, phase characteristics, etc. also contribute to the final sound. I can say nothing about these aspects without actually listening to recordings that I myself have made. I can however evaluate the functionality of this recorder from the published literature. The DR-100 mkIII has numerous improvements over the Mk II, so many that I wonder why they didn't simply come up with a new model number. It does seem to be their way! The unit is powered by an internal Lithium ion battery that can be charged over USB. Furthermore, the unit can be operated using USB power. If all manufacturers should standardise on this format, it sure would cut down on the clutter of adapters. This battery is not made to be removed regularly, but is user serviceable should it need replacing. Reviewers have indicated that you can record for 12 hours on one charge if using internal microphones. Phantom power will naturally reduce this duration considerably. Thankfully, Tascam have also given us a battery compartment for two standard AA batteries. These provide a redundant source of power or can be used to extend the recording time (though perhaps by less than 2 hours). 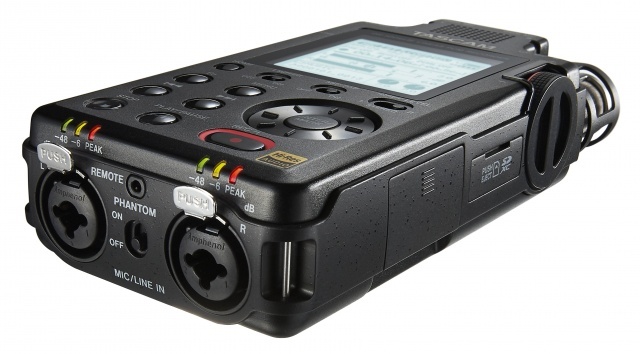 This is one of the very few portable recorders with a digital input. S/PDIF format is accepted on a 3.5mm TRS jack, with a phono adapter included. There are four possible pairs of analogue inputs. Like the Mk II, this unit has two omni mics, two cardioid mics, and XLR sockets with phantom power. Thankfully, the Mk II has something the previous unit lacked, a mini-jack with PIP (plug in power). Finally, a home for our Primo capsules! I should mention the rather odd way of setting levels. Rather than having dual ganged controls, there is only one potentiometer for input. But on the body of a unit is a switch that dictates whether the left, right, or both channels will be affected by the knob. I have never seen such a system but it might in fact be easier to use than the more conventional methods. One welcome feature is that the record levels are stored independently for each pair of inputs. The unit remembers the previous settings, which is a great time-saver. I have to say that it's little things like this that make a big difference out in the field. On the subject of ergonomics, this unit has more physical controls than ever before, and they seem to be more logically placed. For example, the switch to turn on phantom power is located between the XLR sockets. The peak indication LEDs are just above this, positioned on the curved fascia, so that they can also be seen from the front surface. Great design! Note that you cannot control phantom individually for each channel. As noted in the Transom review, this may be an issue in an interview situation, for instance when using a lavalier for the subject and a dynamic mic for yourself. In the menu you can set the voltage to 24V, in order to save battery life when using mics that simply don't require 48V. The Hold switch has two poles. One locks only the record levels. The other locks all controls, so that you can be confident there is no danger of changing settings when moving the unit from pocket to hand or vice versa. There are numerous other improvements. The LCD is much larger than previous, perhaps twice the size. The unit now accepts SDXC cards for up to 128GB storage. (A list of recommended cards is provided.) XRI info is now stored in the BWF file header, so you can examine recording metadata. There is M/S decoding on the mic inputs (though not on line input). Other features are maintained. There is a two second pre-record buffer. The HPF can be set to 40, 80, 120, or 220 Hz. You can record in mono. A speaker is provided for quick auditioning. There is an automatic level control plus you can start recording automatically on a certain input level being exceeded. A digital limiter is available, though without customisation. You can record "dual format", that is to both WAV and MP3 simultaneously. You can even automatically slate a 1 kHz tone before a recording. File marks can be added automatically, at peaks, or manually. Files can be divided at mark points. You can customise the file names and automatic numbering schemes. In the menu, you can attenuate the line output level. Note also that the headphone output can be reduced... and is by default. You may wish to turn this "ear protection" feature off to get sufficient monitoring levels. Tascam may have been the first manufacturer to implement dual recording. You can choose to create a second stereo file with levels automatically 12 dB down from the first. This useful feature has been available on cheaper units, but was missing from the DR-100 Mk II. It's present here, but doesn't work at greater than 96 kHz sampling rate. Unlike some of Tascam's less expensive units, this recorder is stereo only. Though it has ten channels of input, you must choose which pair to record. This may be this unit's biggest limitation. And it's an unusual restriction given that the unit will indeed record four channels of audio, as already noted (WAV and MP3 formats or 0dB and -12dB levels). I do not use the word "unique" carelessly. Certain features available here could only have been thought up in Japan. The second unique feature is designated Dual ADC. While the documentation does not fully explain what this means, it is claimed to increase the signal-to-noise ratio from 102 dB to 109dB. Testing is required. Please note a limitation of the internal processing. You can choose only one of the following features at a time: dual level recording, dual format recording, limiter, or Dual ADC. The housing is aluminum. The unit is heavier and fractionally larger than the previous model. On my chart it is now the largest unit that qualifies as hand-held (as opposed to recorders designed for bag or over-the-shoulder use). It is second in weight only to the Sony PCM-D100. A screw mount for a tripod is provided. The retail package includes a 2GB SD card and the aforementioned digital cable adapter but nothing else. An AC adapter, battery pack, infrared remote control, foot switch, and "Furry-Windscreen" are each available as accessories. In the USA the current selling price is the retail list of $400. In the UK it sells for £400 (though I have found it at one retailer for £310, perhaps in error). At Thomann in Germany it sells for €400. Prices will be in flux, especially in the current financial situation. John Grzinich has provided samples on his blog. There are also examples scattered through Soundcloud, but these are all of poor quality so far. 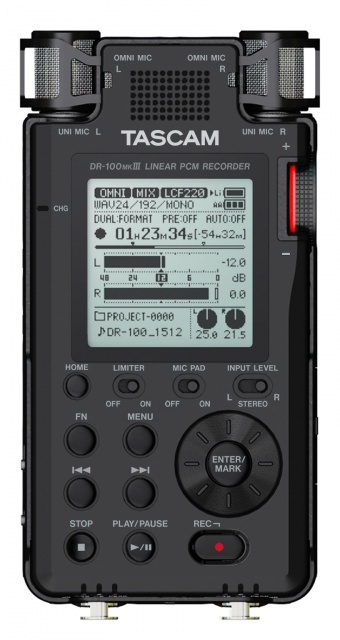 If you want a mid-sized but still very portable stereo recorder, loaded with features, and without audio compromise, the DR-100 mkIII seems to be the winner. It has the XLR inputs missing on similar Sony units, and removable batteries missing on the LS-100. Besides which it has a basic functional look that is much more appealing than the Olympus. Besides which, the presence of digital inputs will make some people very happy indeed. Those who don't need XLR inputs need not spend this much money. Those who need more than two tracks of recording must look elsewhere. I would love to be able to try out this device, so if you are in a position to send a review unit, let me know. Until then I reserve judgement. I have just begun to use my recently purchased copy of this unit. A couple of corrections. The digital input is 3.5mm not 2.5mm. The filter selections are for the A/D conversion, not D/A. My initial recordings with this unit and quiet microphones are promising. Plug-in-power 3.5mm input is fantastic with my Shure omni lav binaural setup. I'm looking forward to some serious nature recording outings. Both errors now fixed, thanks! Good luck with your recordings and perhaps report back. I was about to buy an LS-100 for recording bird vocalisations, but this new unit is making me pause. I like the portability of the olympus plus the low self-noise. I actually returned a tascam DR-100 mkii i had bought around a year ago as the pre-amps felt noisy. Will this be a big improvement? I'll be using it with a Sennheiser ME67 and MKE600. I like the idea of also being able to do some ambient nature recording with the built in stereo mics or with some PIP binaurals but i haven't done this much of this kind of recording before and don't know whether the olympus ls100 will be at much of a disadvantage than this? Thanks! Note: I have not used either unit myself, so data based on what dependable third-parties have reported. Don't use the LS-100 with PIP mics, as that input is unforgivably bad. Buy that unit for its XLR inputs. The noise floor of the Mk III Tascam has been improved 7dB over the previous generation. That is significant. How it works with specific microphones is indeed the rub. Only by trying can you tell. Has anyone tried hooking the DR100 into a Panasonic FZ2500 and external mikes to get higher quality audio? You wouldn't hook it up to a consumer grade camera. If you want sound for a video, record the audio entirely separately. use a clap and sync sound with video manually in post-production. For anything better, get a recorder and camera with timecode. Robin, on second thought. I'm primarily interested in spot news so recording through the camera would be a lot easier. Just wondering if there's a chance of damaging either the Tascam DR100, a mike or the camera. I don't have this recorder or the camera, so I am really the wrong person to ask! But there is logically little point to using a recorder as a front-end for what will be a very cheap pre section on the camera. It makes more sense to get a microphone designed for the camera and plug it in directly. A video forum where people use Panasonic gear would be the best place to ask. Good luck! Anyone else had trouble with an occasional binding feel on the input level knob? Nobody else mentioned a problem with binding or suddenly heavier feel on the input level knob but I just got mine back from TAP and there was a problem involving "mechanical alignment." Fixed under warranty. I own a DR100 MKIII. All prior tascam products I had the chance to use typically had quite good internal microphones with a fairly low noise level. The DR100 MKIII is a little bit better in this aspect which might be the 7dB mentioned in the article. But loosing the AB-Recording means that the subjective overall audio quality might still be lower in this product. But what has been enhanced dramatically is the noise at the XLR inputs. I am convinced that this aspect of the product has been improved by way more than 7dB. But the mileage seems to depend on the microphone used. Some microphones I used with the DR40 were really noisy there but sound quite clean with the DR100 MKIII. Others weren't noisy with the DR40 and aren't with the DR100 MKIII. And one seems just to produce its own noise. Any chance that someone has checked the pip voltage? PIP voltages for the Tascam DR100Mk3 are 2.5V (off load) and 2.0V for a (parallel connected) mono input, using a Primo EM258 capsule. Darn, that voltage is low. Double darn. Are these mki mkii mkii updates across the range of tascams all hardware based, or just big firmware updates? The dr05 original got a big firmware update which then became the V2 for future model releases? I just need confirmation really. Thanks! This is a *hardware* update on just this model. Some other models also got hardware updates. Tascam chooses to mark them as version changes rather than giving them new model numbers. Firmware updates are another thing entirely. Hope this helps!